One of my favorite parts of summer is having a counter full of fresh fruits and veggies, ingredients full of flavor. ﻿The richness of flavor also lets me get away with cooking less. My favorite way to serve a balanced dinner without much prep is to make sandwich boards. A few delicious items along with condiments like balsalmic vinegar and dijon mustard on the side and you are all set. Last night we had a dear friend over for dinner and we all made separate no-cook meals from this board, I made caprese salad, our friend had a tomato sandwich, and Mark, in classic male fashion, made this monstrous sandwich with every ingredient! But doesn't it look so good? Everyone got exactly what they wanted with no fuss. 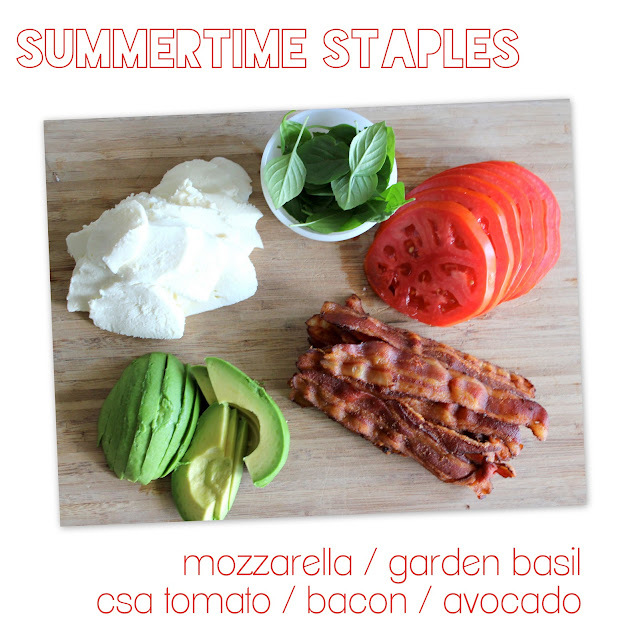 This is definitely a summertime staple for us. What are your favorite fresh ingredients? Do you love no-cook meals in the summer too? such a good idea!! looks delicious too!! i recently re-discovered tabbouleh salad. such a great summertime dish and you can add what you want to it to make it yours. good call sara! tabbouleh and hummus are also summer favorites of ours. I need to give making my own a try. Perfect combination of all the things I love! I love when I have all of these ingredients! They are so yummy! Yum! Caprese salad is my fave. Obviously, Israel would *have to* pile the bacon high. i just found your blog, it's so cute. You are one creative lady. Gorgeous pictures! And I love the idea to do a build your own dinner & see what everyone comes up with! We did a pizza night like this one time where we did potluck toppings & I provided the sauces & dough. It was SO fun. BAH GET IN MY BELLY.